So the sliding closet doors were quickly removed from our bedroom closets. Ugh, they drove me crazy and I was only here for 2 days at that point! I decided a softer look was necessary for the room, which meant curtains. I wanted them to coordinate with the duvet cover fabric I purchased a while back. On our long shopping day recently, Michael and I searched for fabric for said project at Fabricland (laugh, I did, really, Fabricland? !...silly Canada). 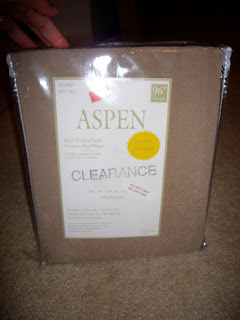 Then I stumbled upon clearance curtains! SCORE!! 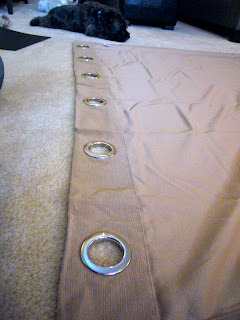 One solid rod panel curtain that just so happens to match the duvet fabric PERFECTLY! Best part?! They were $9.99. Woot woot! So with the measurements I took we concluded we needed 3 panels (wrong!). I didn't take into account I wanted them to have plenty of wave when they hung, so I ended up going back to the store a few days later hoping they had a 4th, which they did. Shew. 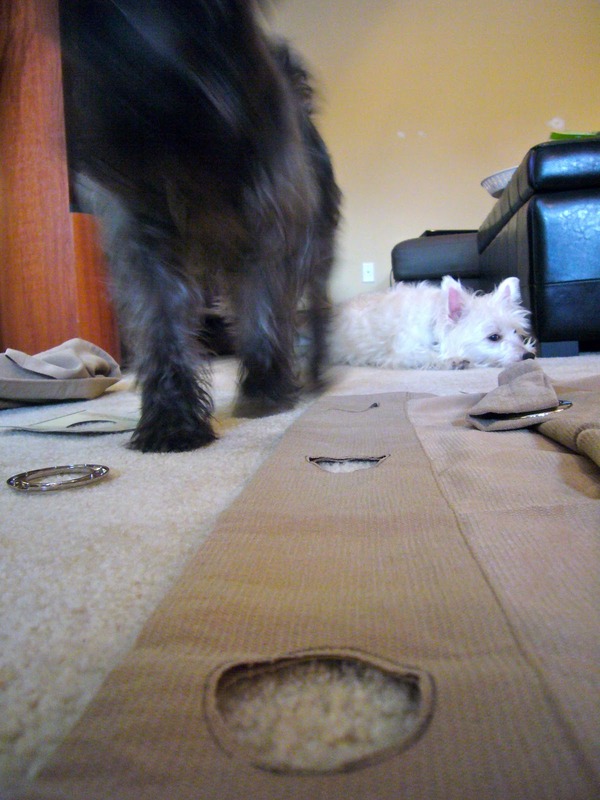 We also bought grommets so they would slide easily over the aluminum poles I bought from Home Depot. So I laid them flat and measured evenly across the top for 6 grommets. There had to be an even number so when they were on the rod the ends would face the same direction when hung. Once measured I used the handy dandy template, which is a part of the packaging and marked each one, then cut them out. Pixel wanted to help as you can see. He moves quickly...hard to capture most of the time. Next, I measured the length and marked it, then ironed the fabric down. Yes, I am ironing on the floor. We don't have an ironing board yet. Priorities, right?! Much better than before, don't you think?! And I can look into my entire closet without struggling with dated doors. Yay!